Trigger Points are hypersentive spots in the muscles, which give you less strength and flexibility, they block the muscles , and upon movement are painfull. An example maybe " I reach back to get my wallet out my back pocket and have pain and less flexibilty in the back of my shoulder blade (rotar Cuff area)". Normally you will have Trigger Points in the Infraspinatus muscles . Then repeat once more before moving to another spot. You may want to wear heavy pants and top when using the Trigger Point Tool, like a track suit. Or if your muscles are hard you can apply the trigger point tool (the ball) to bare skin. Hamstrings can be trigger pointed by placing the tool under your hamstring while sitting on a hard wooden seat. Push down on the tight spots holding until the pain fades, usually 10 seconds for each area. Be sure to work up the middle/ inside and outside of the hamstring. To finish massage legs and have a hot bath. While lying on your back on a hard floor, place the Trigger Point Tool between your shoulder blade and floor. By using your body weight lean onto the tool, finding the tight spots, release when the pain fades. Be sure to work the muscle on the edge of the shoulder blade where it attaches to the upper arm. Work over the whole shoulder blade, be sure to trigger point both shoulders. To finish lay in a hot bath. For working the muscles which run either side of the spine, I always recommend that taping two balls together, allowing a gap where the two balls join, this gap fits where the spine is. While lying on your back on a hard floor, position the Trigger Point Tool so it fits on either edge of your spine. Work up and down the spine, from the base of the neck to the top of the bottom ribs. Work up and down the spine slowly three times. This is when you have pain radiating across the top of the hips, and each side or one side of the lower back, just above the tops of the hips, and below the bottom rib. While lying on your back on a hard floor, position the Trigger Point Tool so it fits on either edge of your spine, just below your bottom rib. After using the Trigger Point Tool rest 4 days before working that body part again. Many beginning trainees desire to increase their Lean Body Mass, and have this as the primary, if not only, goal in mind when beginning a training program. I suppose it is human nature to want to have large muscles and the appearance of power and capability. It was certainly the reason I started lifting weights (at a measly 115-120 lb. ), and is the reason that a great majority of men start lifting as well. 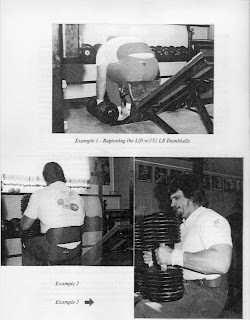 There has probably been more ink spent on this subject in muscle mags than any other topic, from Bob Hoffman, Peary Rader, and Charles Atlas all the way to Joe Weider and the supplement muscle shams of today. Muscle gain comes hard for a natural lifter, and anything over the "normal" level of BW is extremely difficult for most lifters to achieve without resorting to steroids and other drugs. Not difficult in the sense of "it can’t be done", but difficult in paying the price under the iron to get it and keep it. This is particularly true of the ectomorphic lifter. This is the type of male whose "normal and untrained" bodyweight might be 130 lbs., or less, at a height of 5’8" or taller. This is not an individual who would be sick or ill at this weight (although they may look sickly), but the individual whose body type and genetic makeup have him "locked into" a body frame and metabolism that does not support much in the way of muscle mass. For these lifters, it can be extremely frustrating to train with weights, to seemingly no avail. Frustrating when their lifts fail to increase after weeks of trying, and the lifts were not much to begin with. Who, reading this, can identify (whether from personal experience or observation) with the lifter who joins the gym and begins a simple (or very complicated) routine? His friends, also beginners lift much more than him even initially. He can barely bench press the bar and a few 5 or 10 pound plates. They manage to throw up 135, so it at least looks like they have something on the bar. Our lifter can manage 3-4 reps in an awkward squat with 60-70 lb. His friends, within weeks, have 150 and 160 on the bar, and are getting 10, 12, even 20 reps. If the lifter is typical, he will quit the gym and never return. If he is tenacious or hardheaded, he will almost certainly (without common sense to be a foundation to his will) fall into the trap of super supplements and super routines. He will, as many including myself have done, be an avid student of supplement advertisements and the various soft cover training books put out by the muscle publishers. He will be a veritable expert on the benefits of various foot spacing on Smith Machine squats. 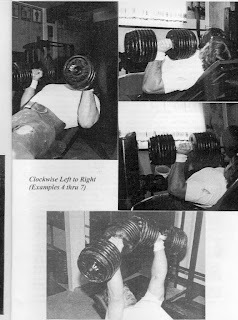 He will know why it is better to supinate, rather than pronate, the hands when performing a set of concentration curls. He will know the proper dosage, frequency, and contraindications for every pill, powder, and potion sold on the "muscle shelf" of his local health food store. And, likely as not, he will not gain a pound of muscle for it all. In all reality, I can hardly blame this individual for this plight. Having "been him" at one time, I can certainly understand how one gets there. It speaks of a certain level of sincerity and desire, but also of a level of ignorance and possible laziness, that is deadly to his goals. There is, however, hope. He is looking for a home, and he is in the right town (the gym). He merely needs to find the correct address and to move in. He will likely need to find the "old neighborhood", the one where the houses were built back in the 40’s and 50’s. Where the houses, albeit dated and old fashioned, are also still standing after 50 or 60 years of weathering the storm. It is here, and likely only here, that he will find the comfort of making gains. Alright. Enough Harry Paschall and J.C. Hise talk. How do you do it? How does a guy who wants to pack 20, 30, 40 lb. of muscle weight on a body that is reluctant to add 5 lb. do it? How does a rank beginner pack on the pounds? And how can you, Mr. Trigg, with your prime physique (ha-ha-ha) tell me how to do so, when you have never experienced such frustrations? I may tell my story later, but today I will tell the story of Mr. DB (Delibabu) Chakrapani. DB is one of my trainees. DB is 25 years old, Indian (not American Indian, but India-Indian), and started training at a bodyweight of 118 lb. at 5’ 9" in height. This was a gentleman well past his puberty, and into adulthood. He had never had any significant bodyweight, and was not recovering from a lingering illness. His joints are all small, and his bone structure is quite light. He is a textbook case of ectomorphia, and he wanted to get big. When he walked through the door, I gulped hard, because this was a test case of any "weight gain" program I could devise, and there would be no hiding the fact if it didn’t work. Luckily for me, I didn’t have to dust off any tomes to find and old-school program for weight gain. Those books are always open around here. Here is the very basic program that DB began on, and utilizes today. Yes. DB is squatting twice a week. Yes, he is overhead pressing twice a week. Yes, he is using "foo-foo" or "pumping" exercises like leg curls, pulldowns, and preacher curls. Yes, he is also busting his buttocks under a real live bar, in squats and overhead presses. He is using a "15 or 20" rep scheme on the squats. Meaning we worked him up from 10 reps to 20 reps in the squat at his initial weight. We then added 5 lb. and had him do 15 reps. Next workout we had him do the same weight for 20 reps. Next workout we added 5 lb. and had him do 15 reps, and the same weight for 20 the next workout, and so-on. He DOES NOT work to failure on the squats, although his last 3 reps are generally reps that the average human being would quit on. He works a strict 15 reps ONLY on the stiff deadlift, adding 5 lb. per week. Everything else (abs excepted) he works to absolute failure, or in the case of the Compound Row, until he can no longer hold the handles back, in the Duo-Poly fashion. What has all of this accomplished for DB? What has our ectomorphic poster boy been able to claim as his reward? The obvious is strength increases from workout to workout. He is getting the perfect (for him) mixture of intensity and rest. He is currently being neither underworked nor overworked. He would tell you he is being overworked every workout, but that is the nature of the task at hand. But his recovery abilities are not being taxed at this time. DB is also registering a 3 lb. gain a week in bodyweight. I know. It amazes me as well. In fact, it makes me supremely jealous. And his diet is "fair" at best, as culturally and physically he is not a big eater. He doesn’t tolerate milk well, and beef causes him digestive problems. So he eats lots of fish, chicken and vegetables. I can only imagine what his weight gains would be if he went on an "American Style" food blitz. But, as well, his dietary practices are very healthy and are minimizing fat gain. So we can assume that his weight gains are almost all muscle. There is nothing "magical" about the above routine, other than the magic of the squat, deadlift, and overhead press. And the routine is definitely a routine that caters to the new trainee. It might not work as well for the more advanced trainee, although the principles are ironclad. But we are speaking of the new trainee. As well, DB invokes more intensity and effort in the workout then he has ever done physically in his life before. It is very much work for him, and exhausting work at that. He is constantly pushed, as around here we live and work by the mantra "at least one more rep or one more pound than last week". So, DB gains. He isn’t ready for a magazine cover. He will not be lifting in the Senior Nationals this year. And he isn’t the strongest guy in town. Yet. But he has gotten a handle on what it takes to succeed in the weight game, and is succeeding as a result. In setting up the program, we want to insure that the trainee benefits from the best selection of exercises and set and repetition scheme. Therefore we must be diligent in this process, and very receptive to the trainee’s specific needs, wants, and limitations. In the previous article we talked about learning about a trainees physical limitations. These are the first consideration in choosing exercises. For example, in my opinion, extremely overweight or detrained persons should not be doing free weight squats, deadlifts, bench presses, or overhead presses. Why such a harsh assessment? Not because of any problems I have with those exercises, but rather with the problems that can come about with their use by the above individuals. Obese individuals are typically “stationary”. Meaning that they rarely move around in their daily activities. Many sit at a desk all day, drive home, and sit on the couch or in an easy chair until it is time to go to bed. Their daily “motion” may be limited to trips to the bathroom or bedroom, and the necessary walking to get from one room to the next at work. Flexibility is poor, balance is poor, and strength is poor in “unused” ROM. Asking this individual to do a squat, even a “non-loaded” deep knee bend, is an exercise in futility, embarrassment, and possible injury. Better to place them in a machine exercise, with a “locked” movement and ROM, and allow them to gain strength over time, to the point that they gain the necessary strength, flexibility and confidence to do a correct squat. There is never a rush to get a severely detrained individual into free weight exercises. It is doubtful that a person 150-200 lb. overweight will be entering a powerlifting meet in the next 12 months, so don’t be in a rush to have them doing the “big three” as if they had to catch up to the competition. Rather get them “in motion” and slowly and patiently increase general conditioning, flexibility and strength to the point where you can move into compound exercises safely and comfortably. With trainees in their mid to late 30’s and up who are not severely detrained, I find it best to begin a weight training program on machines, with some light free weight movements (curls, stiff leg deadlifts, dumbbell bench press). Many of these trainees are capable of learning and completing free weight moves very quickly, and can be moved into a more balanced routine (approx. 50% machines and 50% free weight) in several weeks. My experience has shown, however, that very few individuals who are non athletic and past the late 20’s in age can properly perform a squat or deadlift the first time in. Calf and hamstring flexibility, balance, and coordination all work against this move (and many others) in the beginning. I find it better for me and the trainee to work to some good intensity with machines, and come back afterwards to practice the squats, deadlifts, and other moves. The client is warm and loose. He or she has just “successfully” completed the primary workout and has been encouraged and complimented on their effort and performance (you do encourage don’t you?). They are in a prime place to begin to learn a new skill. These would be very light, low rep moves. Not another workout, but a skills training. This process can be a short one, lasting only a couple weeks, or it may stretch for some time with those who have poor flexibility or strength. Some trainees may best benefit from only machines. One of my trainees is a middle-aged woman with severe rheumatoid arthritis. Due to poor flexibility and joint strength, she utilizes a “machine only” program, using the lowest possible resistance and high reps. She will use 25-30 reps on each exercise, increasing the weight by only 1 lb. per week, if she make all her reps. We must be very careful with her joints, so we err on the side of caution in everything we do. However, her strength is improving and her flexibility has increased to the point that she can utilize a Nautilus overhead press and Pullover in her workouts, where as in the beginning she had to use a broomstick for those muscle groups. She also has only 1 finger on each hand with any “gripping” ability, so machines are ideal for her situation. In summary for that section is that trainees can benefit from the “good” free weight moves (squats, deadlift variations, bench press, overhead press, curls), and should utilize them when possible. Yet, one should not be too quick to move them into free weights if conditioning is poor to start with. If free weights are all that is available, be very conscious of limitations in strength and flexibility and be aware and alert to immediately take control of the weight, and possibly the trainee if the exercise or load proves too great for them. We must always remember that intensity is relative to the condition, abilities, and state of mind of the trainee. We should press for excellence and effort, but not at the expense of safety or common sense. Now of course, none of the above are claimed as “the ideal routine”, but only used to represent a movement from an early reliance on machines, to a more mixed routine, to a routine with some fairly complex and skilled movements. This is also not to say that machines are not effective, or as effective for an advanced trainee, compared to free weights. I prefer a mix myself. But again, the idea is for trainees to learn to crawl before they can walk, and machines teach that skill far better than most free weight exercises and with less potential for injury. With advanced trainees on a machine centered program, one can get terribly wicked with intensity generating techniques and muscular failure sets. Wicked enough to have many less motivated trainees ready to find a good “barbell only gym”. Conversely, millions of trainees have gotten brutally strong and fit with nothing more than a barbell and some space to use it. One could also move to a 3 or 4 workout rotation, keeping workouts at twice weekly, and each workout being done about 2 times a month. Run this cycle by having the trainee run through it twice with progressing weights and 5-6 reps for a warm up. Then run them through it 3 times with no rest between sets (or at least minimize the rest between sets with a whip and pistol). Finish with some abs and light grip work. Takes about 15 minute to complete with a wimp like me, and about 10 minutes with a motivated lunatic. Floor time is variable, however. In summary, one should be careful in deciding exercise selection for new trainees. We want most everybody to progress to the point when they can do complex and skill oriented moves, however it isn’t always the case that it can happen immediately or even quickly. We should also be aware that even our better-conditioned trainees might need a break in period where exercise selection is simple in performance, and that more skilled moves are taught as an adjunct until they are strong and confident enough to make them the backbone of the routine. Lastly, we should be aware that the same old workout grind, day in and day out, could become tedious and even halt progress. We must be willing to experiment and be flexible in exercise selection and order.